Army Petes: These things ONLY happen to me! Oh my goodness. I had the most unreal day! Not just one, but two mortifying things happened to me! Soooooooo, Thursday I went to the Lady doctor to figure out what's going on with my defective bladder. Apparently surgery will not fix my problem. The doctor decided my problem is probably hormonal. So she gave me some samples of a estrange type medicine. This medicine is not administered orally. The name of it is "Vagifem." (Who on earth named that? Because personally I think they should be fired.) I tossed the samples into my purse and forgot about them. Monday morning as I was running out the door, I saw the samples and tossed them onto the table. When I came home from running errands Walker came up and offered to help me. I thanked him and he helped me into the house. At this time Heidi is screaming. For some reason Walker stepped into the house before I did. As I stepped into the house I remembered the Vagifem. Elbows out, with Heidi in hand I sprint past Walker beating him to the table. I set Heidi on the table on top of the Vagifem. Relieved I start setting things down in the kitchen. Heidi is still screaming. As I turn around I apoligize to Walker for Heidis screaming. In that moment I hear him say "It's because you set her down on something and she is uneven." I then leap six feet in an effort to beat Walker to the Vagifem box. It's a white box and in huge Purple lettering says Vagifem. There is no missing the name of this stuff. I do not beat Walker to the box. I grabbed it and tried to shove it back under the car seat. He saw it. I know he saw it. Walker is fifty something retired military. I could have died. There are only a few people who I would really be embarassed in this situation. Walker is one of them. I sent out Heidis first wave of birth announcements a week or so ago. I don't know Pauls side of the family very well. In my address book is an uncle Leo. All I know about Leo is that my father in law loves him. So I send him birth announcments and Christmas cards. As always I had sent one to Leo. Well, as I was going through my mail I got a card from Florance. Florance is Leos wife. In the letter she writes. "Well my dear Sweet Leo, Love of my life passed away Oct. 12 2010. It's a year now, today. So it's Very hard I'm alone here I miss him so much." Not only did I send a birth anouncment to Leo, who is dead... But his widdow gets it on the one year anniversary of his death! If I could have died I would have! I still might! That's twice in one day that I would have gladly died! I told Paul about what happened and he assured me that Leo would have found this very funny. Last week was really hard for me. I don't know what my problem was. Maybe depressed? I don't know, but my work outs were awful. And I could have slept 20 hours a day. I turned a corner on Saturday afternoon. Thank goodness. So with last week being so weird I had no idea what to expect at todays weigh in. I was down 3.8 pounds! Yay! I really needed that! I was a good girl about drinking my water! And the lady weighing me in gave me a very enthousiastic "Good Job!" She is such a fair weather friend. What weight watchers needs is a good confecional. My confession would have gone like this..."Team leader, forgive me for I ate 14 of my 30 points in 2 point fiber one Brownies." It's because of a day like that... I have sworn off of all sweets till Thanksgiving. I took about 5 days to consider such a drastic measure. I am at peace with my decision and I hope it helps me to get this weight off. I'm in a place right now that moderation doesn't seem to be working for me. The other morning I woke up knowing I had a GREAT idea when I slept. It took me most of the morning, but I was able to remember. My brilliant idea was.... barbed wire pillow cases! With David gone Molly keeps getting into bed with me. Molly thinks it OK to spoon into the back of me. It took me five years of marriage to convince David that we would not be snuggle sleeping. I don't mind Molly in bed with me, if Dave's not there. But the spooning has got to stop! So my idea is this... If I had a barbed wire pillow case for my body pillow I could put it in the middle of the bed, seperating Molly and I, solving my problem! There is no way I am the only parent who does not want to be spooned by there hot little 2 year old. David and I met this grizzly on our way out of Alaska. We fed it beef Jerky! :) It was so awesome to be close to such an amazing animal! We fed him from the car. This is a char from the Air Force Academy. 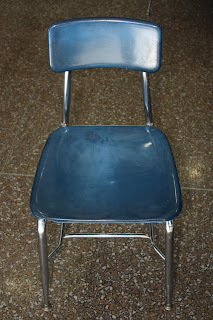 The very same chairs that my father in law sat on when he went there in the 60's. I really like these chairs. I love how well they are made. I feel like they are standing the test of time. It was cool to see the mess hall full of these old school chairs! Loved your funny post. Especially about uncle Leo. I wonder if florence knew who she was sending it back to. Probably not. Wish we were closer. It was fun running with you during my visit. It's harder by yourself. Hang in there! Tell Molly hi! I miss your kids, and cant wait to see you at Christmas. Vagifern? I can't even begin to describe the visual in my head. Good luck with that!